How does the email status work? How is the Email Score calculated in Microsoft Dynamics CRM? In the case that you have sent out an event invite and need to send to additional contacts, you can either add extra recipients to the original marketing list or create a new list, and then send the previously sent email Campaign. Select the relevant Campaign by selecting Marketing and Campaigns, making sure that the view is set to ‘Default’. To the right hand side of the below image you will see the Marketing Lists, click to ‘see the records associated with this view’. 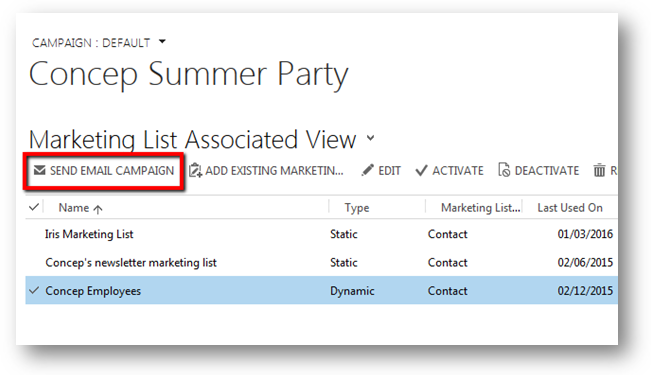 Once you have selected to view the marketing lists, you can either select the list that was previously sent to (which you have added the new contacts to) or select a newly created list with the new recipients in. 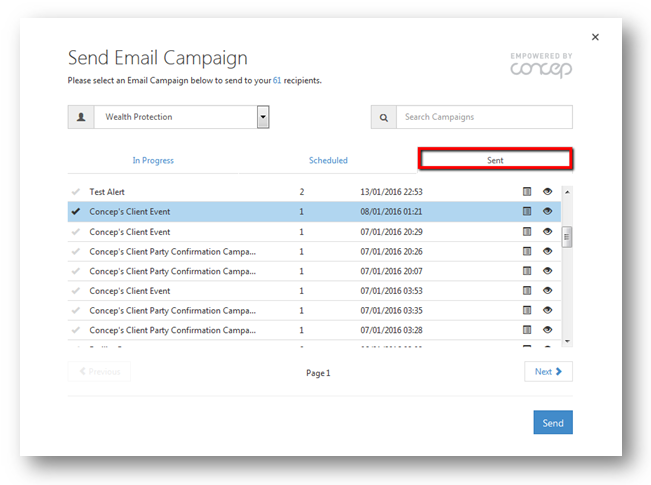 After the relevant list has been selected, click ‘send email Campaign’. Select the account that the invite was sent from, and then find and select the sent Campaign. You can see the total of all contacts in the marketing list at the top of this box. In the example above, there are 61 recipients in the selected marketing list. If you click on this number, you will also be able to see the total number, which includes recipients who have previously been sent to. Tick the box, select the Invited response code and click Send. Please see here for more details about creating responses. Once you have confirmed and the email has been sent, the sent Campaign stats will be updated. Please note that the system will not resend to recipients who have already received the email; it will only send to those who have been newly added.